Josef Keller, proprietor and chef, was born in Switzerland, attended chef apprenticeship and hotel business school there, and worked in fine hotels in Geneva, Zurich and Verbier winter resorts before moving to the United States. He worked in Philadelphia and at the Swiss Lakewood Restaurant and Lodge at Lake Tahoe before selecting Santa Rosa as his home, and home for his quickly popular La Province Restaurant. Josef’s serves true French Continental Cuisine in a European atmosphere enhanced by a glowing fireplace, original art and turn of the century architecture. 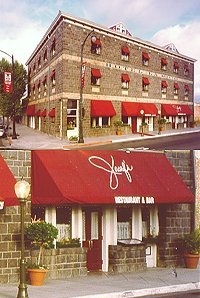 Josef’s Restaurant has three banquet rooms as well as the dining room to accommodate small and large groups. Perfect for both business meetings and for intimate gatherings. Let us help you select the ideal space for your needs. Booking is available via our email. Celebrate a unique Mother’s day with us – and don’t forget to get a present for your mother! Combined rooms create the possibility for groups of up to 125 persons. Dinner is served Every Evening. Lunch is served Tuesday through Friday. The Cocktail Lounge, which is open during Restaurant hours, features Sonoma County Wines and a full bar.